This is a guest post written by Alexis Trinidad. Also See How To Become a guest author on BlogTipsNTricks. It’s every blogger’s dilemma; writing fresh content for their website. This may sound cliché, but the blogging world is all about nothing else but content. What makes people compelled on your blog is the combination of your topic, opinion, writing style, and most of all, freshness. Your blog will definitely go a long way if you start writing new and up to date content. Compare this with a newspaper. What kind of person will read the same news over and over again? This same principle applies to your blog. If you don’t update your website with a fresh content, there will be no reason for people to visit. As a blogger, you must always have something new for people to see. New blog posts don’t just give people a reason to visit your website, they also help in terms of traffic along the search engine. Each new post becomes an entry point for these people to notice your blog. The more entry points you gain, the more the chances are for new readers to find your website. According to Google itself, Google Alerts are email updates of the latest relevant Google results (web, news, etc.) based on your queries. Here is where you enter a search query that you wish to monitor. There will be a preview of the type of results you would want to receive. Just some of the uses within your reach from Google Alerts include getting the latest about an event or a celebrity, keeping tabs on your favourite sports teams, observing an emerging news story, and keeping up to date on a competitor or industry. Google lets you set up as many Alerts as you want to as many topics you’d love. You’re the one in control of which to track, which kinds of contents, and how often you want it. 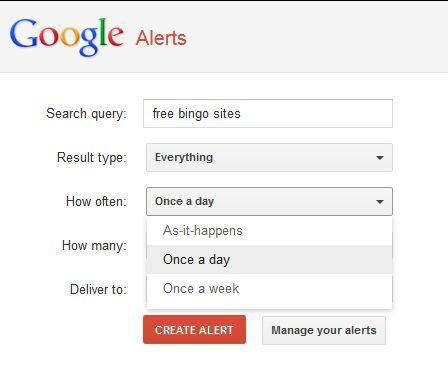 Google Alerts currently offers 6 variations of alerts. You’re free to choose among news, web, blogs, comprehensive, video, and groups. 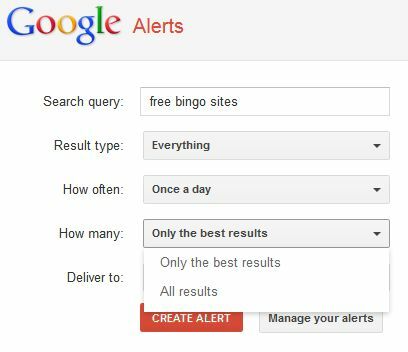 For example, if you would like to write about free online bingo games, you can use Google Alerts to keep you abreast on the latest news about those free bingo sites. Don’t know how to use Google Alerts? Read on. How to Create Google Alerts? You’ll notice that after typing in your query, a “mini-me” version of a search results page will appear on the right corner. The search results page includes everything it has to offer; however, these are the latest results— search results published in the past weren’t included in the list. You can go on and click “Create Alert”; however, it’s nice to tweak the other parameters a bit. For the “Result type”, your search will give you everything Google can search in its different categories. Meanwhile, if you’re only interested in News, Blogs, Videos, Discussions, or Books, Google can limit these results for you. Quite handy, eh? “How many” option gives you the choice if you only want the best results or all of it. The best results are those closely relevant to your search. 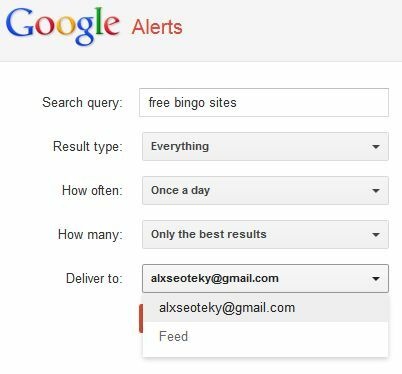 Lastly, you can choose where Google drops the results; whether in your Inbox, or receive it as it happens by choosing “Feeds”. Remember that your “How often” query will be set to “As it happens” once you choose “Feeds”. If you have multiple Gmail accounts, better select the one you use often; so you can keep track of your notifications. Hooray! You’re done! You can always manage your alerts on this page, or just proceed to http://www.google.com/alerts/manage. Just click “edit” at the rightmost part of the page. You can choose to receive HTML emails or text emails. Export your alerts in a CSV file if you’d like to save your alerts on your computer. 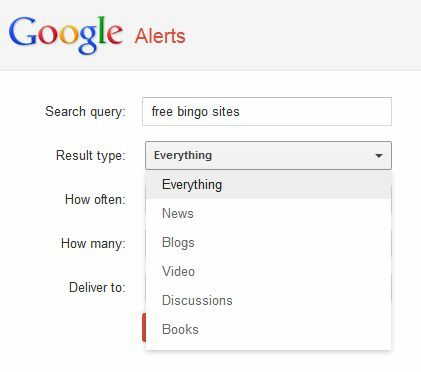 Google Alerts can get too excited to send you messages, so I recommend that you create an Alert filter for Google Alerts. That way, you can keep your Alerts organized despite the clutter of emails you have in your Inbox. Another interesting way to use Google Alerts is to find your content stealers. Anyone could come on a website, copy its contents and then paste them on a new domain and claim the whole thing his own. If you know that a piece of your content gets stolen every once in a while, create an Alert for it. Once anyone tries to post it on their site, you’ll be notified in the blink of an eye. If you’re a businessman, Google Alerts also has something to offer for you! It can help you track down potential buyers. If someone out there asks the web about something he needs and your business offers it, Google can help you find him! Google Alerts is just another chance to make life a little easier. Be one of the huge fans as you start to unravel the world of this new innovation. Alexis Trinidad is a freelance guest ‘blog-hopper’ and bingo enthusiast of free bingo sites. She wants to help people enjoy entertainment without any financial constraints. Also can you share the code u used to add that about the author. This one looks clean. I suppose you could check out the Page source. But still, I think it depends on the theme installed in this site. Jose have to add the CSS code with the above html code to make it work. To add the CSS code search for ]]></b:skin> in the edit html page. Before that paste the css code given above and save your template. Then paste the html code(given by alexis) where do you want to show the box. Hi Jose, See this post for better understanding.